1. Put about 4 cups of wood chips (Hickory or Mesquite are fine) in a bucket with water. If possible, soak your wood chips several hours ahead. This makes for better smoke. 2. 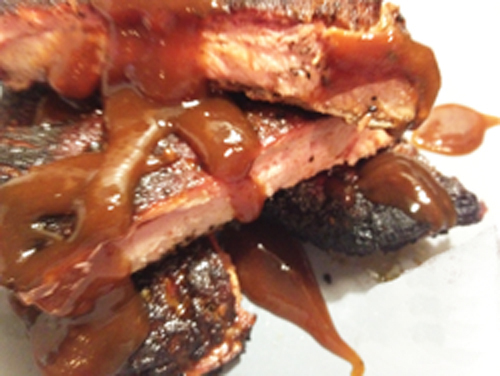 Coat the ribs with the Kansas City Steak Rub and let them sit while you prepare the fire. 3. Use of a charcoal grill is preferred. Stack a medium to large mound of coals on one side of the grill and start the fire. You will be cooking on the other side, away from the coals. BBQ, in contrast to grilling, requires indirect heat for slow cooking. 4. Throw some wet wood chips on the coals. Place the ribs as far away from the hot coals as possible. You may need to cut the slabs in half or stack the ribs. This is fine as you can rotate them during cooking. 5. Every half hour or so, throw some more wet wood chips on the coals. Keep the grill covered at all times with the vents open. 6. BBQ the ribs for 3 to 4 hours, moving them periodically as needed.